Taking on a big powerful breed such as the Akita is a major commitment. You need to consider some factors before your decision. Most people are drawn to the male because of their size and substance. You should consider if everyone in the home will adapt to the adult dog that he will grow into. Make sure the dog's care giver is up for an adult Akita. 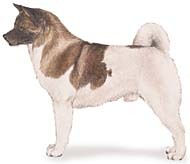 The female Akita is equally good, just a smaller size, and can be more family oriented and loving. As a pet the female can be spay to avoid the every six month season and any problems that accompany. I prefer that all pups bought as pets be spay/neutered. Both male and female Akitas are territorial, so it's very important to expose pups to different people, animals, and situations. The more the pup experiences at an early age the more he/she will realize these things are a part of life, not a challenge. Regular park visits, social outings, walks in the neighborhood expose the pup to people, animals and situations they need to become a well mannered, social Akita. When training an Akita pup, I suggest for first time Akita owners an obedience class. If possible the whole family should attend. The foundation you establish now will reflect in later years. With respect, education, patience, and love you will have a loyal friend that will stand by you. Akitas are headstrong and confident, they do not like repetition. They need their exercise if you choose to keep them in a kennel make sure they have their play time every day. They do jump and can dig, so it's best to have a 6ft fence with some kind of footing/foundation to prevent them from digging out. Remember an Akita that's always in a fence looking at the world out side is NOT a properly socialized dog. That life will be unhealthy, unsatisfying and could be dangerous. They need to interact, not just watch life go by. Evaluate your life style, can you provide the time and commitment an Akita requires? Once you have determined you can provide a responsible forever home for an Akita, then its time to find your match. It's important that you don't pick the first cute pup you see. They are cute but soon grow to be large and strong! Look at the pup's personality, is it bold and confident? Are they outgoing, friendly with a happy disposition? Do they respond to you, submit when asked? They need to be solid with good structure. These are just a few important things first time Akita owners need to consider and research BEFORE choosing an Akita. Akitas are wonderful pets, but are not for every one, they come with lots of responsibility. The decision must be thought through to ensure a happy safe life for you, your family, your neighborhood, and the Akita pup.